Initial configuration for this lab can be downloaded here. 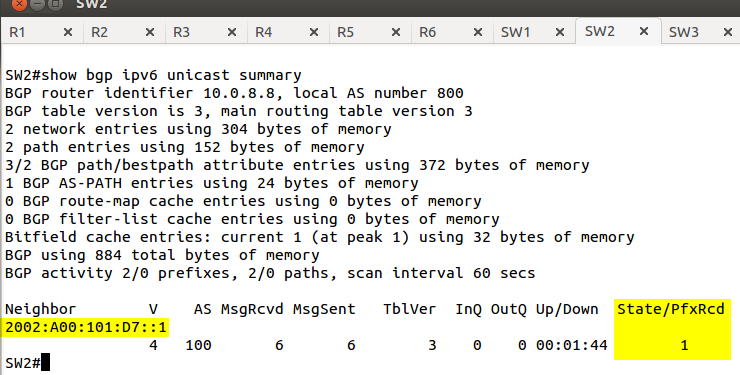 On BB1 enable static routing towards 172.16.0.0 subnets using R3 as the gateway. Create Loopback0 address on BB2 with the address of 10.101.101.254/24. Ensure R3 is the gateway of last resort for EIGRP AS 1. You can use a static route to accomplish the task. Configure an extended ACL on R3 allowing all TCP traffic from EIGRP AS 1 reach 10.100.100.0/24 only if it was originated from EIGRP AS 1. Pic. 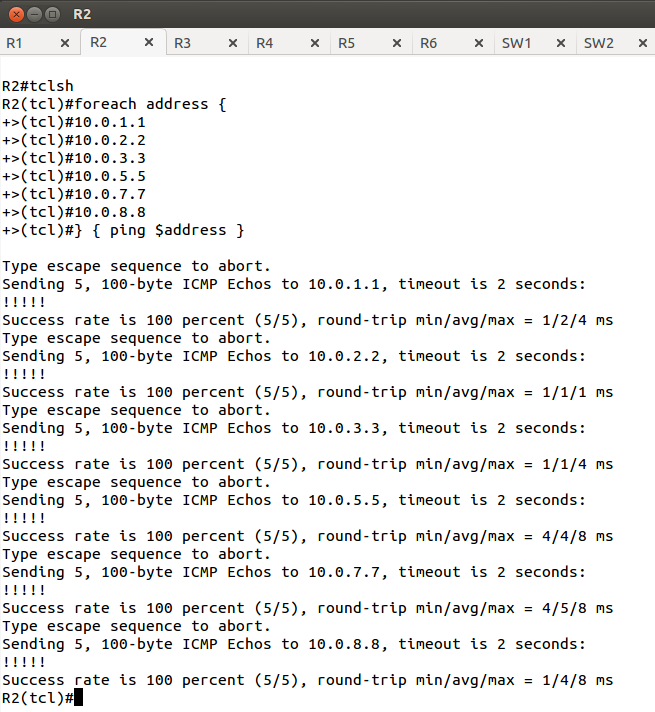 2 - Ping/Traceroute Test. Pic. 3 - TCP Traffic Originated From EIGRP AS 1. Pic. 4 - Traffic Originated Outside EIGRP AS 1. REMOVE the ACL configured in Task 2. Enable HTTP service on R5 for testing purposes. On R5 configure ACL which is going to block HTTP traffic from Vlan 27 towards R5's loopback address (10.0.5.5). HTTP traffic from any source towards 172.16.215.5 destination should be allowed. All other traffic should be allowed as well. access-list 100 permit ip any any! Pic. 2 - Telnet Test. Enable EIGRP AS 1 in Vlan 27, Vlan 215, and on frame-relay connections between R1, R2 and R3 (as per topology diagram). Advertise loopbacks of R1, R2, R3, R5, SW1 and SW2 into EIGRP AS 1. Ensure connectivity between all those loopback addresses. Using standard ACL filter out the traffic from Vlan 27 destined for R1's Loopback0 interface (10.0.1.1/24) and all the destinations behind R1. Upon successful completion of the Task 2, remove ACL from the router. Pic. 2 - Ping Test. Using standard ACL filter out the traffic from Vlan 27 destined for R1's Loopback0 interface (10.0.1.1/24) and all destinations behind R1. Pic. 3 - Ping Test. 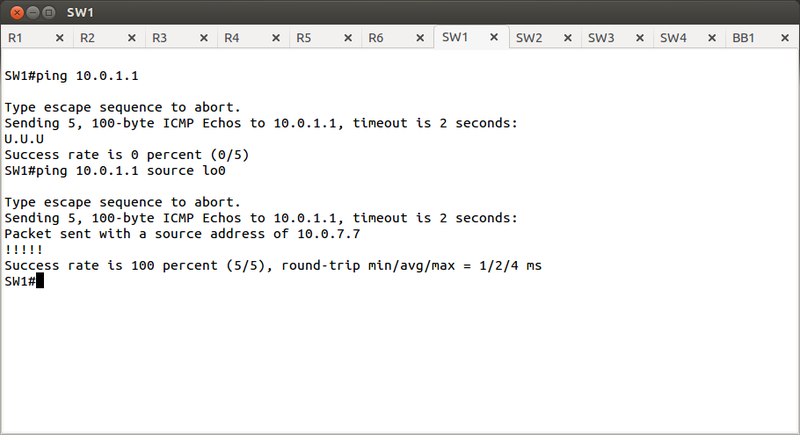 Ping sourced off of Vlan 27 fails, but sourced off of SW1's loopback (not 172.16.27.0) the ping test succeeds. 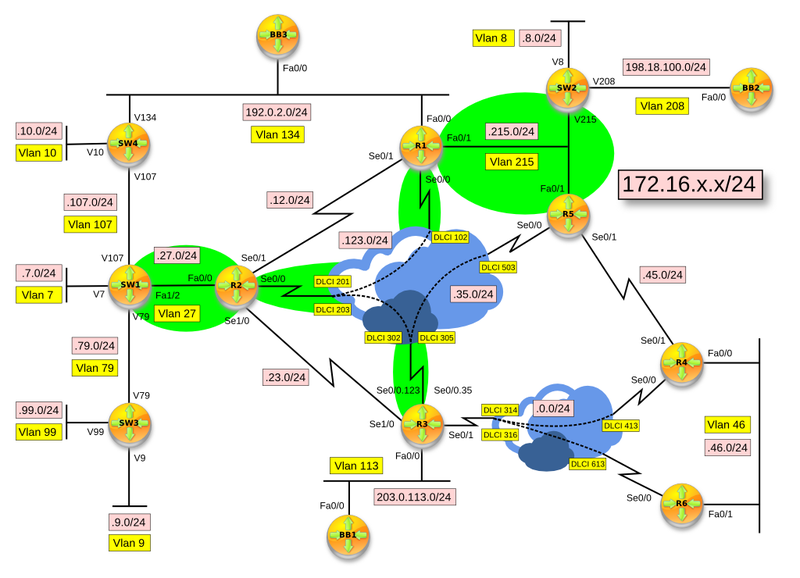 Enable IPv6 MP-BGP peering between R1 (AS100) and SW2 (AS800). 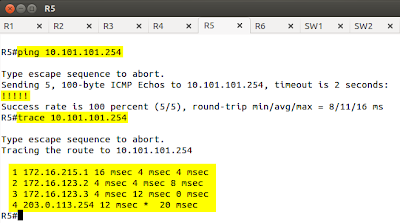 Advertise IPv6 addresses configured on Loopback1 interface of both devices into IPv6 MP-BGP. Check the connectivity. 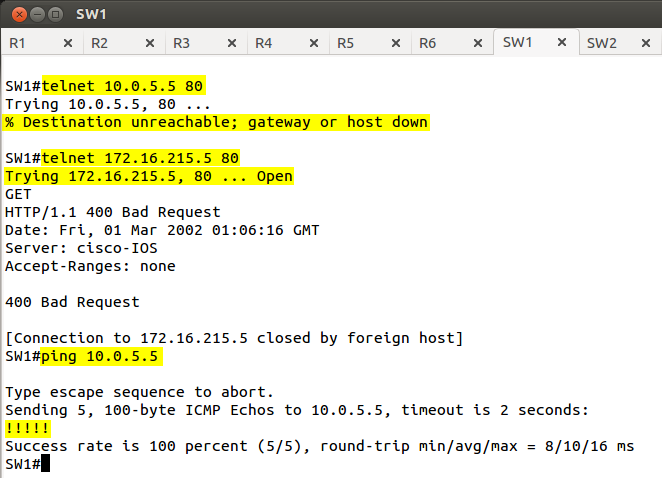 Enable IPv6 BGP peering between R1 (AS100) and SW2 (AS800). 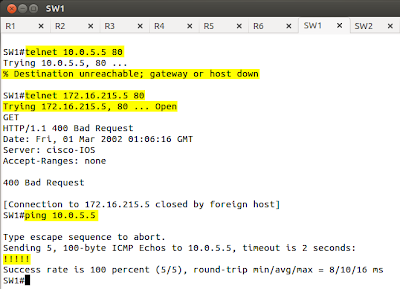 Advertise IPv6 addresses configured on Loopback1 interface of both devices into IPv6 MP-BGP. Check the connectivity. The configuration of IPv6 address family may be different on your router. It depends on the IOS version you use (neighbor and network statements should be configured in ipv6 address-family but may show like in my example). Pic. 2 - IPv6 MP-BGP Neighbor. Pic. 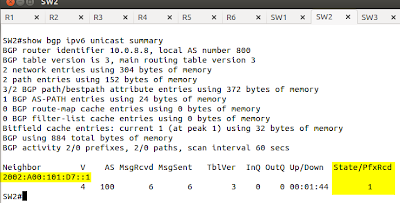 3 - IPv6 MP-BGP Table. Pic. 4 - Connectivity Test. The tunnel IPv6 address should use 2002:: prefix reserved for this method. You are allowed to use one static route on R1 and SW4 to solve the problem. Use RIPng on both sites, but there is not supposed to be RIPng prefix exchange between Vlan 215 and other Vlans on the remote site. 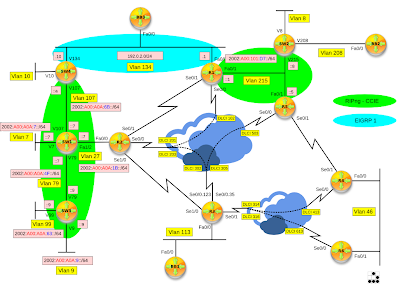 Create addressing scheme for all Vlans in question and the tunnel interface. 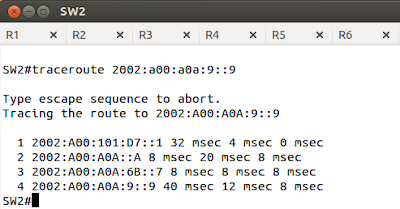 Border-Router-Prefix (based on the loopbacks) of R1 and SW4 (leading 0s in IPv6 address groups can be omitted). Configure the addresses on all interfaces in question and enable RIPng on those. Pic. 2 - IPv6 addresses. After checking neighbor-to-neighbor connectivity proceed to step 3. Configure tunnel and static routing between the sites. Pic. 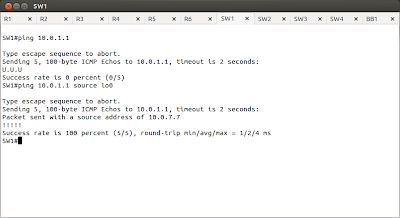 3 - Simple Ping Test. Pic. 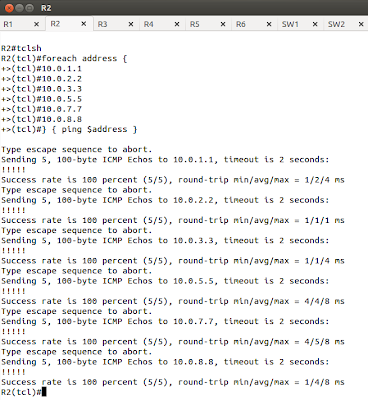 4 - Traceroute Test.